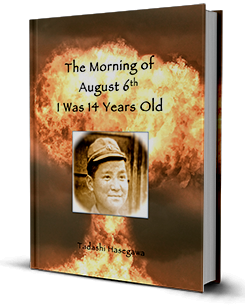 Tadashi Hasegawa was a 14 year old boy when the atomic bomb exploded near his home in Hiroshima Japan on August 6, 1945. In this, the first video in a 3 part series, he describes that fateful morning in vivid detail recalling everything he saw, heard, and felt during one of the most horrifying events in human history. Tadashi Hasegawa was a 14 year old boy when the atomic bomb exploded near his home in Hiroshima Japan on August 6, 1945. In this, the second video in a 3 part series, he describes he and his families struggle to survive those first few months despite his terrible wounds and lack of food or medicine. He is on the verge of death, with no hope in sight until his father’s chance encounter with a nearby Jesuit novitiate and Fr. Pedro Arrupe. Tadashi Hasegawa was a 14 year old boy when the atomic bomb exploded near his home in Hiroshima Japan on August 6, 1945. In this, the third video in a 3 part series, he describes how when there seemed to be no hope, a chance encounter with a Jesuit priest would result in his miraculous healing and set him on the path to priesthood and his life’s work of speaking out against nuclear war.